We’d love your help. Let us know what’s wrong with this preview of Box Turtle by John Himmelman. To ask other readers questions about Box Turtle, please sign up. It's one thing to read that a box turtle can live more than 100 years, but this book really brings home that point! Wow! This book is a wonderful timeline of a box turtle who lives over 100 years. Her life begins in a New England forest in 1890. In 1897 she lays a batch of eggs and then wanders along dirt roads where new neighbourhoods are sprouting up everywhere. The evolving world around her is depicted in timely backgrounds featuring first a horse drawn buggy, then a model-T car. Time progresses and in 1909 the box turtle catches moths attracted to an electric street lamp. In 1913 a motorized car runs over her This book is a wonderful timeline of a box turtle who lives over 100 years. Her life begins in a New England forest in 1890. In 1897 she lays a batch of eggs and then wanders along dirt roads where new neighbourhoods are sprouting up everywhere. The evolving world around her is depicted in timely backgrounds featuring first a horse drawn buggy, then a model-T car. Time progresses and in 1909 the box turtle catches moths attracted to an electric street lamp. In 1913 a motorized car runs over her but luckily she escapes with only a chip on her shell, no injuries thank goodness. After fifteen years a boy captures her and takes her home as his pet. Her journey keeps on going and the world keeps on turning and changing constantly. Unfortunetly all these alterations are not for the good and some present danger and threat to her habitat. Luckily humans become aware of endangerment plights and soon conservation and preservation techniques are implemented to save the remaining woodlot and rescue those vulnerable creatures from homelessness and even extinction. This educational story has historical value and teaches kids about conservation and the habits and the life cycle of the box turtle. I loved the whole concept. I particularly loved the tender and gentle ending, a lovely surprise that will pull at the heartstrings of the reader. The illustrations are truly beautiful, vibrant and empowering to the text. I highly, highly recommend this book. As a lover of all turtles and the natural world, I thought my son would enjoy reading this book. I felt the book had a lot of potential but there was something lacking. As an adult I understood the perspective of the years and how it showed that box turtles can be long living but for a child who is still trying to learn about weeks and months and days of the year, putting centuries into perspective without some context might be difficult. The illustrations were lovely and brought a lot of room for discussion, to point out the different animals and trash pieces. I did like the inclusion of the passenger pigeon, which as a biologist I could figure out that's what they were alluding to (but even by that point in the end of the 1800s, wouldn't they have been already rather decimated in population?) but the average parent would likely have no clue until reading the notes at the end. Really cool concept - following a turtle through its 100+ year life and seeing the world change from its perspective. But I don't think it's clear enough to illustrate the changes to really young kids for whom 1897 is a totally abstract concept, and it's also too simple to provide a lot of narrative interest or information for more advanced readers. Could be a good way to talk about history/time/turtles with some caregiver facilitation, but I don't think I'll end up using it for storytime. This would make a good addition to a collection! It's follows the life and times of one Eastern Box Turtle. Not a lot of info about them, but a nice story about a turtle and its home. The illustrations were nice and I look forward to finding a copy of the book so I can see it in color. I've lived long enough to see many changes toward wildlife and the environment and this book makes me smile with it's good message. Definitely an interesting read - but I think it might be better for sparking one-on-one discussions rather than necessarily as a storytime read. There are so many things in the background illustrations to talk about, relating to conservation and history, that I feel like this is definitely a book to take long pauses during. Definitely liked the note at the back! This book's pacing was so abrupt that I sometimes felt like I had skipped a few pages. It was interesting to read a book from the perspective of a turtle over the course of history, but the story needed more development. I was pleasantly surprised by “Box Turtle.” The bright colors were wonderful and balanced out the plain story. The afterword was educational and interesting, too. 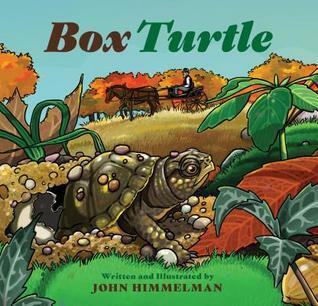 Box Turtle by John Himmelman is a children's book that follows the life of a common Box turtle. However, there is nothing 'common’ about this old gel at all! She lives to be over a hundred years old. In the background if her life, we see humans arrive in the area. More and more homes appear. So do cars, and she gets run over by one. Thankfully, the rough incident only chipped her shell. A young boy finds her and keeps her as a pet until he leaves for college. He releases her back to the wild. De Box Turtle by John Himmelman is a children's book that follows the life of a common Box turtle. However, there is nothing 'common’ about this old gel at all! She lives to be over a hundred years old. In the background if her life, we see humans arrive in the area. More and more homes appear. So do cars, and she gets run over by one. Thankfully, the rough incident only chipped her shell. A young boy finds her and keeps her as a pet until he leaves for college. He releases her back to the wild. Decades later, the pair meet again, each ancient now. Turtle’s land has become a preserve, and nature is reclaiming it. She can no longer see homes, though humans do still pass through. My cubs and I read this story together. It is so sweet. Poignant and sad as well. I never knew common box turtles could live so long. Growing up, my family and I always stopped to move turtles off of streets, so they wouldn't get run over. Where I live now, turtles aren't prevalent. We do still move injured animals from the road, and get appropriate care. Now, I'm more likely to be called upon to rescue birds. This book is a great choice for young readers, and as a bedtime read. It houses a great deal of teaching in a few gentle words, and in the gorgeous artwork. Our favourite part was when Turtle shared a meal with her granddaughter, and you got to see the different patterns to the shells. I was excited, as an associate director of a reptile rescue, to read this book but unfortunately it didn't live up to my expectations. It was cool to see history pass through the eyes of the box turtle but the writing style was not very interesting for the fact it is a picture book. I liked the pictures but I can't imagine the story holding the interest of a young child. I did really appreciate the last footnote page as a rescuer though. According John's Facebook page, he has been "making up stories and scribbling pictures since I could hold a crayon in my hand. It became my job in 1981, when my first book, "Talester the Lizard" was published during my last year in college (S John Himmelman is the author and illustrator of more than sixty books for children, including Chickens to the Rescue. He lives in Connecticut with his family. According John's Facebook page, he has been "making up stories and scribbling pictures since I could hold a crayon in my hand. It became my job in 1981, when my first book, "Talester the Lizard" was published during my last year in college (School of Visual Arts)....It behooves a writer to try and turn what interests them into their work. I've been fortunate to do that with my love of nature, with books - for adults and children - focusing on different natural history topics."